Roses are always a favourite plant to grow and everyone has a list of favourite roses. Roses may be popular for fragrance, or for colour. Some roses are popular for the name that they carry. A rose name can has significance for many people, maybe a memory. Our list of Top Roses is built around a range of factors, see the complete list below. 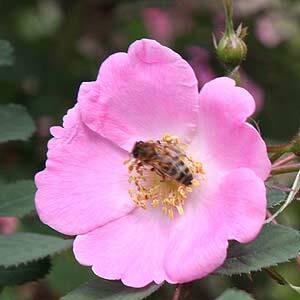 Some of the more interesting names for roses include Rosa sweginowii, pictured right, certainly a favourite with the bees. Roses for cutting are a slightly different list, here we are often looking for long stemmed varieties, however many roses sold commercially at ‘cut flower’ are not that great in the garden. We are often asked what is the ‘best rose’ or most popular rose, without doubt one of the best sellers of all time has has been the white ‘Iceberg Rose’ bred in Germany in 1958 by Reimer Kordes. Iceberg roses are almost disease resistant, they are easy to grow. Flowering over a long period and with clusters of lightly scented white flowers it really is a great rose and a tough rose. Grow it as a standard, a tall shrub or even find the climbing form, yes its a beauty, but listed below are some of our other favourites. For all the right reasons, easy grow, disease resistant and a nice scent, its not the most popular rose for no reason. This is a long flowering ( repeat flowering) vigorous climber. Large flowers cream to pink. Deadhead to encourage flowers. Another Kordes introduction, and a great climbing rose. Fantastic yellow flowers, this is not a repeat flowering rose, but it does have masses of flowers running along the stems. A large flowered creamy white with pink – red. Very fragrant, lots of flowers. A David Austin Rose. Beautiful yellow cupped double flowers on tall growing canes. We have this one as a climber, prolific, long flowering and hardy. If you are after a red flowering fragrant rose then this is one of the best, deep red velvety flowers along with a heady fragrance. The ‘Sweetheart Rose’, with a perfume that smells like, well it smells like a rose should smell like. Long flowering with light pink flowers. Also comes in a climbing form. For our UK and US readers go to Roses for the UK or Roses for the USA for suppliers.